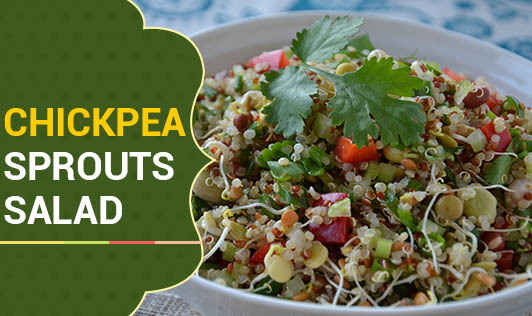 Chickpeas and green gram sprouts are a helpful source of zinc, folate and protein. They are also very high in dietary fiber. They also contain appreciable amounts of Vitamin C.
Nutritious and tasty, high on fiber and vitamin content. •Peel and cut cucumber into medium sized cubes along with pineapple, and tomatoes. •Chop coriander leaves and spring onions finely. •Chill in the refrigerator for 20 minutes. •To make the seasoning, mix together lemon juice, black pepper powder and salt. Tastes better when served chilled.